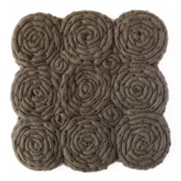 Nanimarquina, Spiral brown carpet: Handmade, serene, natural rug. These are some of the values that can be appreciated with a simple glance at this collection, where the material — wool — is the clear protagonist. The secret is the technique used to make it: totally by hand. The superimposed spirals curl up around the boiled, felt wool without twisting, which makes it more compact. Nanimarquina, Spiral brown carpet: Handmade, serene, natural rug. These are some of the values that can be appreciated with a simple glance at this collection, where the material — wool — is the clear protagonist. The secret is the technique used to make it: totally by hand. The superimposed spirals curl up around the boiled, felt wool without twisting, which makes it more compact. Once made, these are sewn one by one onto a cloth base with visible stitches. This makes the piece unique, available in two colours: brown or ecru. A return to basics, with an image that provides the evidence.